Assume a sincere and mature attitude: One of the most important things you can do as a young symphony attendee is to show the regulars that you are serious about the music you are there to hear. According to my experience, this seems to entail two major principles of the symphony: dressing nicely, and like an adult; and being respectful while the music is playing, refraining from childish fidgeting and any other blatant distractions that tend to be bothersome. Above all, remember that you’re attending an artistic event, not a college fraternity party. Prepare for long pieces: Because of the mechanics of modern popular music, young people are often daunted by the sheer magnitude of many of the standard classical pieces in the repertoire, which, rather than being tailor-made for the radio, for the rushed and frantic party scene, are often ornate and complicated entities that have to be rolled out over a forty or fifty-minute timespan. As you listen to more and more classical music, the length becomes a normal and endearing feature of the pieces you love, but until then, it can difficult to handle. As such, you need to mentally prepare yourself to be patient and attentive while you are sitting in the concert hall: By getting plenty of sleep the night before the concert, ensuring that you are well-rested as the music plays, it will be much easier to appreciate the machinations and the subtleties of the pieces you hear. Listen to a recording of each piece at least three times before you attend the actual concert: This may seem like an odd piece of advice (after all, with most popular music, the song tends to lose its freshness and excitement the more you listen to it), but it is my view that doing so will allow you to better understand the overall thematic framework of each piece, making it so that you may pay more attention to aesthetic and structural details than to larger, more general musical trends. I think that one of the main issues that young people have if and when they attend the symphony for the first time is that they get lost while listening to long pieces of music, the sort of which they’ve never heard before. But if you are somewhat familiar with how the main themes go – if you generally know what to expect from the music, and have already, perhaps, developed useful strategies for effective and enjoyable listening – then the whole process will be much more powerful. You might think that this strategy will ruin the spontaneity of the music, but on the contrary, the pieces you are going to hear are generally complex and generally able to provide you with something special each time you listen to them. Plus, you can’t compare listening to a recording of a piece and listening to a professional orchestra’s live performance: the latter is much more vivid and thrilling. Attend the pre-concert lecture: It is likely that many of the symphonic concerts you attend will feature pre-concert lectures given either by the conductor, a soloist, or some other knowledgeable person associated with the orchestra. Typically, these lectures discuss the historical and biographical contexts of the music and its composer; without them, it is difficult to understand the music fully unless you are already well acquainted with music history and theory. As such, you should attend them – you will be surprised, I think, at the extent to which the information provided by the lecturer can enhance your listening experience. Make it a full cultural experience: One of the things that makes the symphony so enjoyable is the whole experience it tends to represent – a night out on the town, relaxing with friends as you enjoy some fine music, getting dinner beforehand and coffee afterwards at the best locations in the city. Of course, the actual music makes the most difference, but there are several factors which affect your enjoyment of it that you should seek to control: whether or not you are rushed or calm, the acoustics of the venue you are visiting, the quality of the conductor and his or her orchestra, and the location of your seat in relation to the stage and the performers. All of these factors can act as either obstructions to or catalysts for a greater artistic experience; if you have the expendable cash, be willing to spend it on improving the quality of the night as a whole. Also – and this is an important point that many people miss nonetheless – realize that you are not going to like every piece, and that you are not behooved to give up classical music just because your first concert bores you to death. In many ways, the best tastes are acquired. Don’t clap in-between movements: If you haven’t listened to much classical music before, be careful with your applause, as the last thing you want to do is ruin the serenity of a movement by clapping boisterously at an inopportune time. Most of the pieces to which you will listen have multiple movements; if the piece is a symphony or a concerto or a sonata, it will most likely have four movements (sometimes three, sometimes five). If you’re not sure, just follow the program and wait until the conductor drops his or her hands and the rest of the audience begins its applause. You’ll probably be surprised at how excited and loud the audiences tend to be at these concerts (it’s one of the biggest myths about the symphony – that attendees are overly tame in their appreciation of the music): Don’t refrain from being boisterous once the proper time for being so arrives. Do a bit of research on instruments and musical forms if need be: This is a minor point, but you should probably be somewhat familiar with the general qualities of each type of instrument in the orchestra. You should also be somewhat familiar with the various forms composers use for their music – sonatas, symphonies, concertos, overtures, arias, etc. – so that you’ll be able to navigate the differences and similarities between the various pieces you hear. With a bit of knowledge, you will be in a better position to contextualize and appreciate the music being played. Be ready for encores, and stay for them if they come: I’ve been to concerts with people who want to rush outside to beat the traffic right after the last piece finishes, which is understandable, but costly if there’s to be an encore. 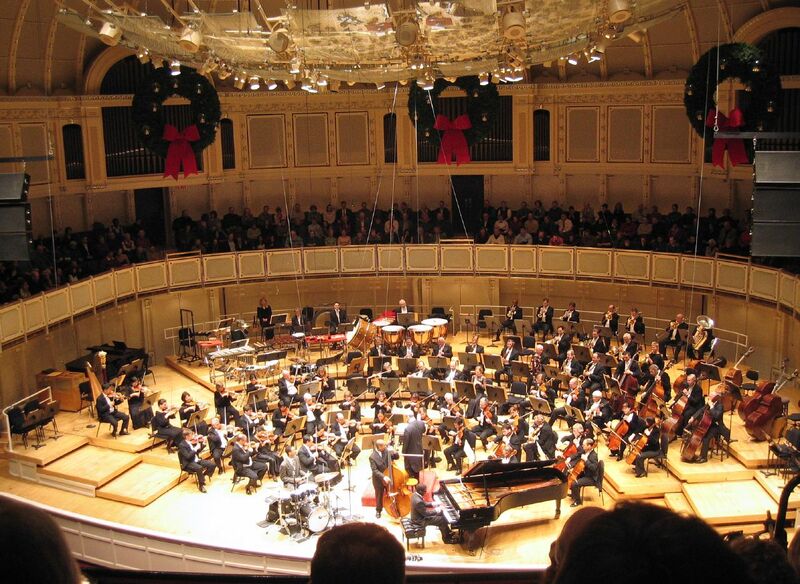 Encores are usually performed if there’s a soloist accompanying the orchestra, but orchestras do them by themselves sometimes (especially if they are visiting or touring orchestras), and the results can be very exciting. Encores are generally short – though there may be several of them – and the conductor and/or soloist will leave and return to the stage several times before he or she performs again. The trick is to just keep clapping. Don’t be discouraged by the snobs: To end on an encouraging note, there will likely be snobs and charlatans – people who see the symphony as a social statement rather than a musical experience – who may look down on you because you are younger or less wealthy or less “cultured” than they. Though it is tempting to engage their silliness, you should simply ignore them – because they really don’t know much about music, anyway. Some older folks might be surprised or impressed that a young person is attending, and they might ask you prying questions or throw you condescending stares – seriously, it happens to me all the time – but in the end, it’s most important that you throw out all the trite stereotypes people have about the symphony in order to focus on what actually matters: the music.